SAH strongly opposes the proposed elimination of these and other federal agencies which have been crucially important to the work of SAH and its members and have provided enormous benefit to the American public. 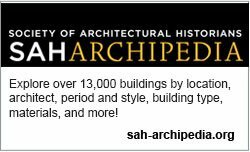 Since 1986 SAH itself has been awarded more than $2.0 million in competitive NEH grants which served as seed funding for the Buildings of the United States publication series and its online edition, SAH Archipedia. That funding has leveraged more than $3.0 million in additional funding from private foundations, corporations and individuals. If NEH funding is eliminated, SAH stands to lose $80,000 in matching funds from its 2016 NEH grant to create new interpretive content, curricula and nationwide public programs for SAH Archipedia. SAH members have received crucial funding from NEH to do research, organize summer teacher institutes, create films and public programs, curate exhibitions, restore manuscripts and sound recordings, and innovate with digital humanities projects. NEH is one of the most important sources of funding for our profession, and we must fight for it now. Arm yourself with facts about why NEH, NEA, IMLS and other federal agencies that you care about matter. Follow NEA, NEH, IMLS and other agencies on Facebook and Twitter. Share their news, accomplishments and current funding struggles with your social networks. Follow the National Humanities Alliance on Facebook and Twitter, share their posts with your network of colleagues and friends, and sign up for NHA’s email blasts with updates, alerts and calls to action. Do the same with Americans for the Arts, which advocates for NEA. Visit, write or call your members of Congress to oppose elimination of the federal agencies you care about. To support NEH, IMLS and international education programs with one click, go to the NHA website. Because so much is at stake, SAH will continue to ask you to take action on behalf of NEH and the federal agencies that are important to you. It’s tempting to give in to fatigue but we must keep making our voices heard. Thank you in advance for your support of the federal agencies that support history, education, libraries, and so many programs and institutions that are crucial to our profession.